1) Guerlain Météorites Highlighting Powder Pearls n.3 Medium: Amazing illuminating pearls of powder with an addictive violet fragrance. This product is iconic and a little pricey but it's surely worth the money: it gives the skin a nice glow and makes you look radiant. These colorful beads are truly magical and I'm totally hooked. 2) Sephora Collection The Magic Trick - Eye Set (Limited Edition 2017): Every fairy needs a magic wand to cast spells..just kidding! I bought this kit for the cute packaging: it contains a gold eyeshadow and a black eye pencil, ideal for festive makeup looks. 3) L'Oréal Paris Color Riche Matte Addiction Lipstick n.346 (Scarlet Silhouette): I just love this lipstick which doesn't dry out my lips but is even moisturizing. The shade I picked is so rich and eye-catching, it's very lovely to wear and stays on for a long time. I think I will purchase another in a different shade. I want the powder pearls! Mi ispira tantissimo il prodotto numero 2. Buon week end Lilli! Questa volta chiudo gli occhi visto che dopo l'ultima volta che hai postato qualcosa del genere mi sono comprata una pelliccia! 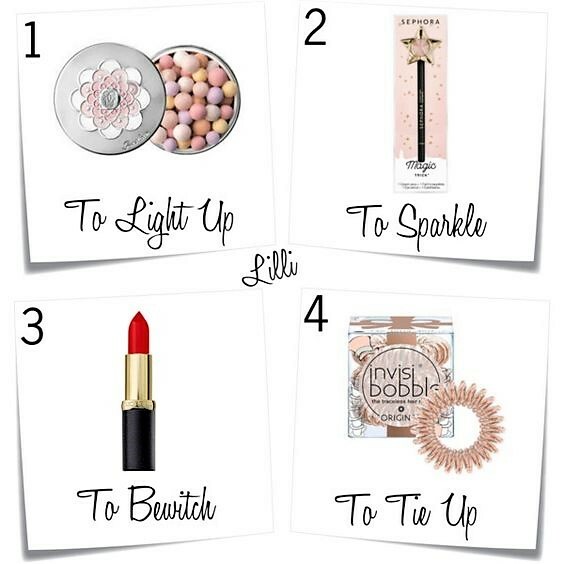 Adding sparkle to our make up is perfect for this Christmas season. The magic wand is a clever product. I can see why you fell under the spell of the Sephora Eye Set! The packaging is just delightful and the products sound perfect for creating holiday eye looks! Happy weekend Lilli! Quel set occhi di Sephora deve essere mio! Molto bello questo set, un ottimo regalo per questo Natale! Nice choices Lilli! In the past two years I've started wearing red lipstick too.